Crowns and Onlays (sometimes referred to as caps) are artificial coverings that are used to improve the appearance, restore the shape, size and function of teeth that are heavily broken down and filled. • To protect weak teeth from breaking or to hold together parts of fractured teeth. • To restore broken or severely worn teeth. • To encase and support teeth with large fillings where not enough of the natural tooth remains. • To support and hold a Dental Bridge securely. • To improve the appearance of misshapen or heavily discoloured teeth. • To make cosmetic modifications for aesthetic improvement. How long does crown treatment take? Whilst a crown is a strong long term restoration it is important to be aware that not all crowns can be provided without potential complications. The underlying tooth is normally already heavily broken down and compromised so there a chance that it can still become carious and break. Also if the tooth does cause any problems afterwards it may require root canal therapy and then potentially a new crown with a post or it may need to be removed all together. 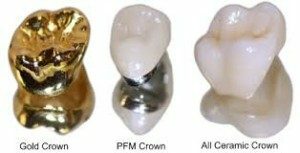 What is a Dental Crown made from? This is a crown that utilises the latest porcelain technology to bond to a high fusing precious metal substructure. This crown is constructed by a skilled team of technicians to ensure a high quality crown is produced. It is strong due to the metal substructure and the colour of the porcelain over the top is matched with your existing tooth colour as close as possible. On back teeth where appearance is not so critical a gold crown is usually the academic material of choice. The amount of tooth preparation and drilling for this type of crown is very minimal in comparison with the others and is the most tooth friendly restoration. A high content gold alloy is used which is the most hard wearing and long lasting of all crown types. Pressable ceramics are used to produce a highly aesthetic and life-like appearance for your crown. There are different types of ceramics that your dentist can discuss with you that would best your individual circumstances. This can be a happy medium between the above two. Tooth can be prepared removing only where necessary and keeping the margins above the gumline, where at all possible like the gold, to reduce the amount of overall preparation. There are no metal or alloys in this crown and its lifelike nature and strength make it ideally suited for any tooth in the mouth including back teeth. The colour of this crown is matched as closely as possible with your existing tooth colour. Your Dental Team will discuss with you what the best option is based on your teeth and individual requirements. Crowned teeth do not need any special care, but will still require a regular, Dental cleaning routine at home and routine visits to your Dentist and hygienist. Therefore, continue following good Oral Hygiene practices – brushing your teeth twice a day, one of which should be last thing at night and flossing once a day – especially around the crown area where the gum meets the tooth. Call us today on 02079356809 to arrange a consultation where we can discuss any other concerns further.